Hi my beauties! How are we all on this lovely Sunday afternoon? Unfortunately I'm currently in bed, trying to nurse myself back to good health after being sent home from work due to feeling horribly ill. The downside is that I'm feeling pretty awful and I missed a full day's worth of pay - but on the upside, this does finally give me a chance to sit down and write a blog post! 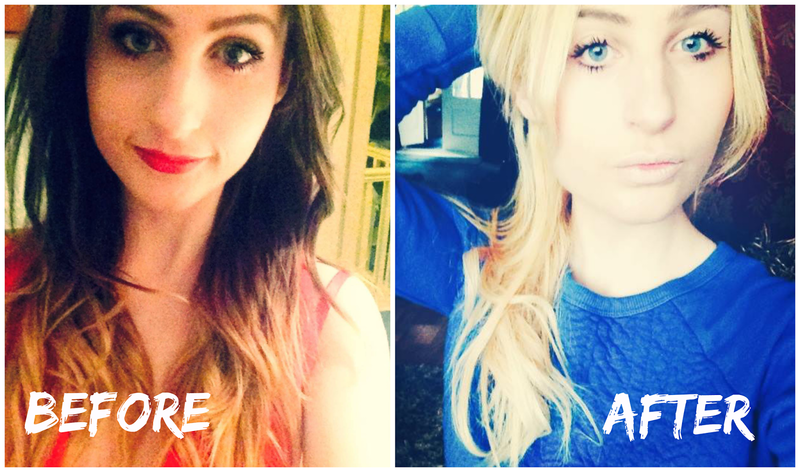 Today's post is a hair dye tutorial of my exciting yet rather scary, brunette to bleached blonde transformation. I've been blonde for a couple of months now, and I still love it as much as I did the first time I set my eyes on the new me, so that must be a good sign! I'm not going to lie, the process has had it's challenges and moments of needed patience, but it's been worth it. I'll skip right to it and show you how it was done! Stage One: The Failed Attempt! 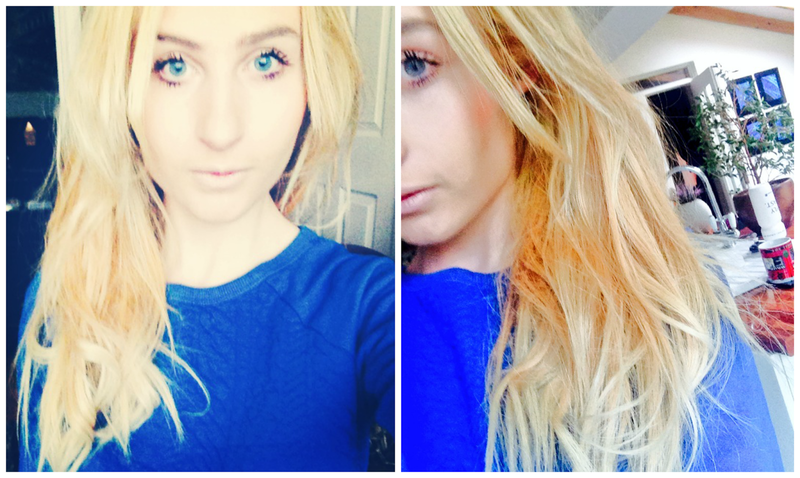 When I decided to lighten my already ombre hair, I actually had no intentions of going fully blonde. The main reason for that was because I was still apprehensive of whether I'd even suit blonde hair, so at first just decided to bleach the ombre parts whilst adding a little more blonde towards the roots.. but not quite all of it! Pretty hard to explain, but I shall demonstrate with a picture..
As you can see, in the photo where my hair is wet after washing the dye out, it's covering most of my hair but not quite all of it - and also looks rather gingery! Luckily, though, the colour brightened considerably once blow-dried and styled. I was really happy with the result, but it wasn't quite as blonde I had hoped.. 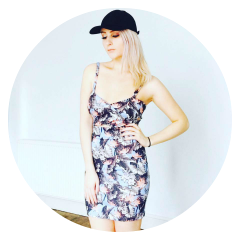 I used Live Colour XXL Absolut Platinum 00A and was expecting it to turn my hair superrrr bleach blonde, but clearly that didn't happen, so I wasn't too impressed with the product! Despite this, I did like how my hair looked overall, but decided after this move I was ready to go completely blonde and give myself a change. No make-up and white hair- scary look! The bleaching process was not easy nor quick, but again, I fortunately had my friend who is amazingly good with hair and has plenty of experience with bleaching to help me out! We used the L'oreal Paris Perfect Blonde Creme Maximum Bleaching Kit, 2 bottles to make sure the job got done and to cover all of my long hair, and then rinsed out the dye after leaving for around forty minutes (with a plastic bag wrapped around my head to lock in the heat - it supposedly helps the dying process, even though you look a bit daft for a while!). Next, we applied Touch of Silver Twice a Week Brightening Shampoo generously - and I mean extremely generously - all over my hair. We wanted to make sure there was no trace of gingeryness afterwards, so covering the hair in this lilac miracle worker helps considerably. After leaving that on for a little while longer, I rinsed that out, and the process was finished! *Make sure not to leave the lilac shampoo on for too long, though - it may actually leave you with purpley/blue hair! Once I got home, I was actually pretty scared the hair colour had come out wrong - before I had styled it properly again, it looked SO ginger, and I was convinced I would need to wear a hat for the next few weeks until I could wreck it with bleach again! Fortunately enough, it looked a lot better once I'd straightened it and made it look all pretty, and it was only really the roots that were a more yellowy-colour than the rest of the hair. The hair colour transformation was a close-enough success! b) Not only did the dark brown hair show up noticeably on my roots around my scalp, but also on my hairline - pretty annoying! So, after trying to wait as long as possible before bleaching again, I made another appointment with my stylist friend and had her use the same dye as before (and silver shampoo). One bottle was more than enough this time, seeing as the majority of my hair was already covered, but we went over the rest of my hair once more as well as the roots that genuinely needed re-doing. The end result was much lighter and much better than the first time! 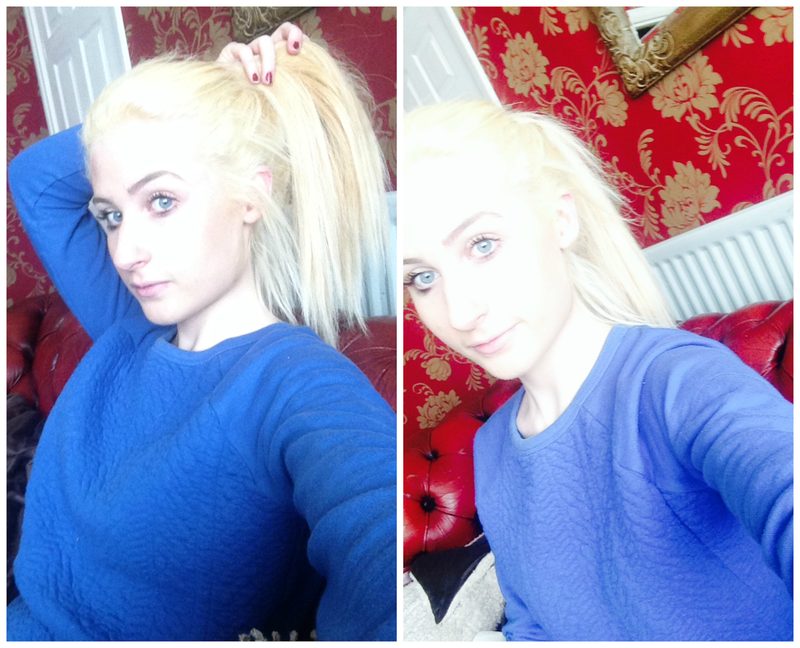 My roots were done completely and I now had hair that looked more bleach blonde, compared to the yellowy tint I had before, haha. 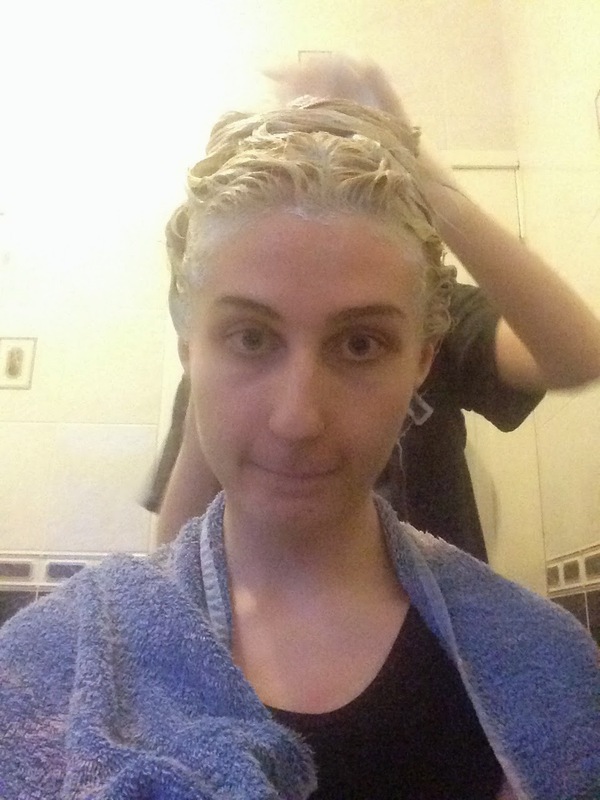 Oh, and the dye was left on for at least an hour this time - definitely helped! Every week I make sure to deep condition my hair to keep it healthy - I've noticed since I've bleached it, it does have a tendency to frizz more and feel more dry (as if it wasn't naturally frizzy enough) but I knew I'd probably be dealing with that when I made the decision to go blonde! 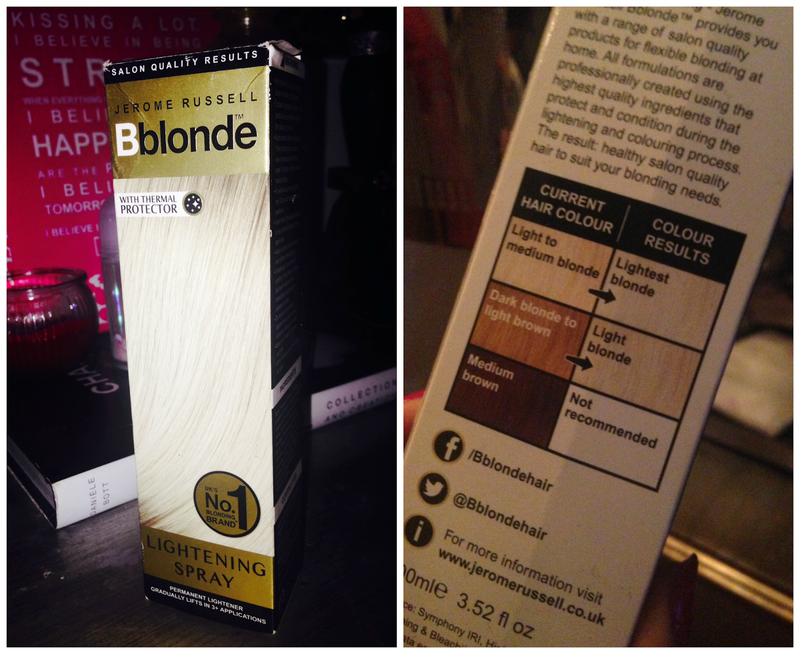 Another product I invested in after bleaching my hair for the first time was the Bblonde Lightening Spray by Jerome Russell. I ended up buying this whilst looking for a toner in Tesco, and though it can take up to three applications before you start seeing results, it does make a difference and improve the blondness of your hair! 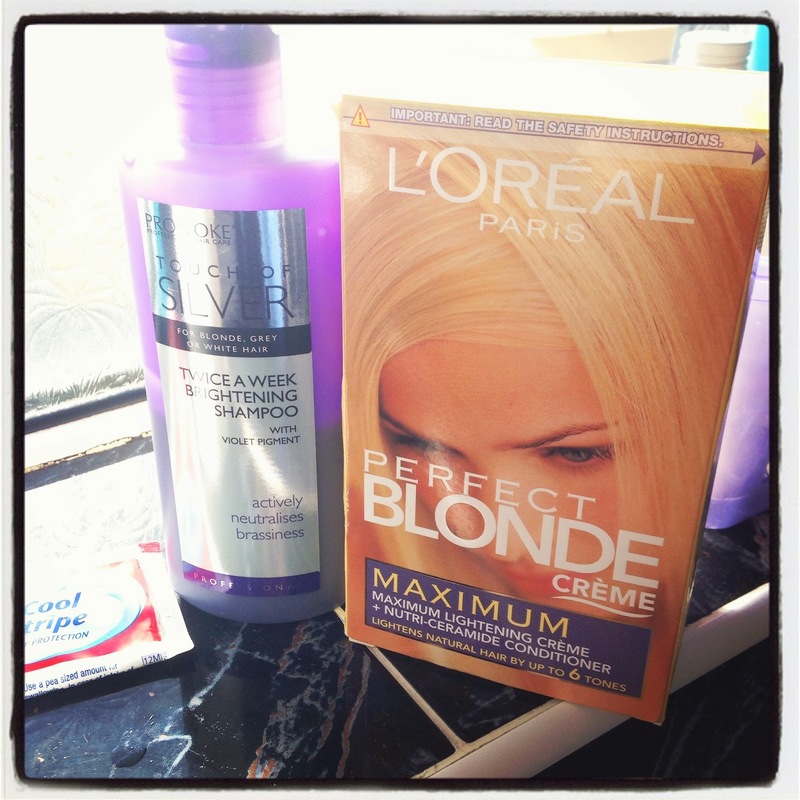 Bleached hair is high maintenance, so before you make the decision to go blonde, make sure you realise the consequences! Your roots will grow back quickly, especially if your hair is anything like mine, and so you will have to get used to the idea of bleaching probably at least once a month - leave it longer if you can bare it! As I'm sure everybody knows, peroxide is very damaging to the hair, so if it's the only thing you do please make sure you have some nourishing hair treatments, whether it be colour repair or damage repair, at the ready. They don't need to be massively expensive either - drugstore brands will do! Your hair probably will go a brassy/ginger/yellow colour the first time you dye it- but fear not, a toner or lightening spray like I have should do the trick until your next bleach. If you want to see what products I use on my hair already, you can find out in my hair growing secrets post here - the list hasn't really changed! Do not exceed 10 applications of the Lightening spray - I'm not sure why you're not supposed to, but I'd rather not take the risk and find out! So there we have it guys. I hope my experience/review helps you, and if you have any questions on anything I used, or anything else for that matter, please do not hesitate to ask in the comments! What do you think of the new look? 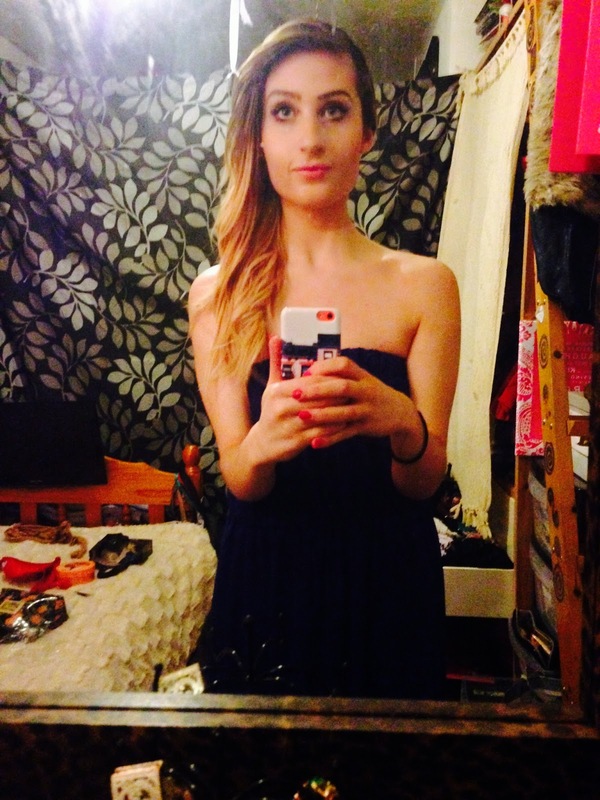 Have you ever dyed your hair a dramatic or opposite colour? Thanks a bunch for reading, and have a beautiful week. See you soon!